When we boarded the plane for Rome, I was in a bad place. I hated the way that I drew, hated the projects working on, and had come to dislike the very act of drawing. So I was fleeing the country. In Florence, I learned to draw for pleasure again. Just for fun. Just to relax, to take it all in, without worrying about making a 'good' drawing. After our month there, I couldn't look down a street without wanting to draw it for the naked joy of making marks. That's the most important thing I brought back from Italy. 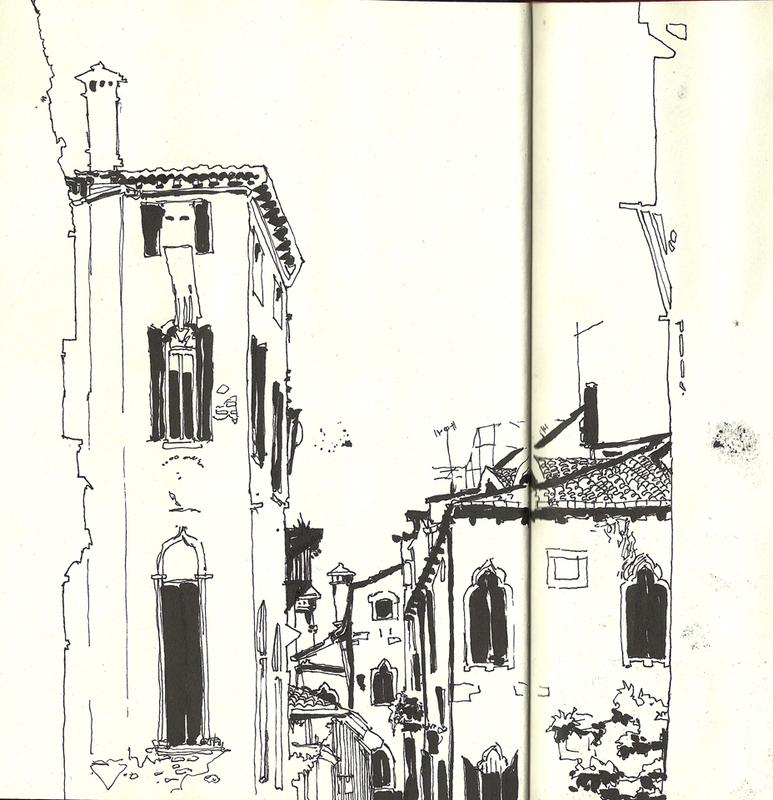 In Venice I decided to draw comics for a living. I got up early every morning to draw and paint with Natalie. During this drawing, I realized that if I wanted to draw comics every day. Forever. These are a few of the artists that helped me through recovery. Bummer. I didn't make the list. I thought for sure I'd be on there. them florence+venice scenes give me an enrique breccia vibe i think, which is good because the guy did alvar mayor which is basically my most favorite comic in the history of forever etc. Jake, your work has always been amazing to me. I'll never forget that wonderful time in Italy; I feel that both of us improved our talents a great deal while there. 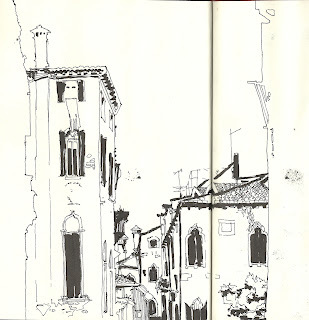 Gorgeous studies, and it's great to hear how that beautiful city helped re-inspire you. I was in Florence for 4 measly hours on a European tour, must go back!! great post, jake. I remember a couple big moments like that in my life so far, hopefully I'll have a few more. Yay! I loved Italy. And our time there. I just got goosebumps. Jake. You and Italy made me fall in love with art again. I couldn't remember the last time that I had done art for fun before. Now I feel like its all I ever do! I owe a lot to you and Italy. PS. I love your drawings and their line quality. Especially the first one. With the sweet tree and the crowded cars in the little street. Its perfect. Those are beautiful drawings Jake, but you already knew I'm a fan of your travel drawings. Thanks for the links to the other guys - I think you showed me a couple at ACA, but it's good to have them handy.